Before you say anything… I am well aware that I might be some sort of unhinged mad scientist. Lunatic? Possibly. Some might call me a Cake Alchemist. Well well well. Look at that. 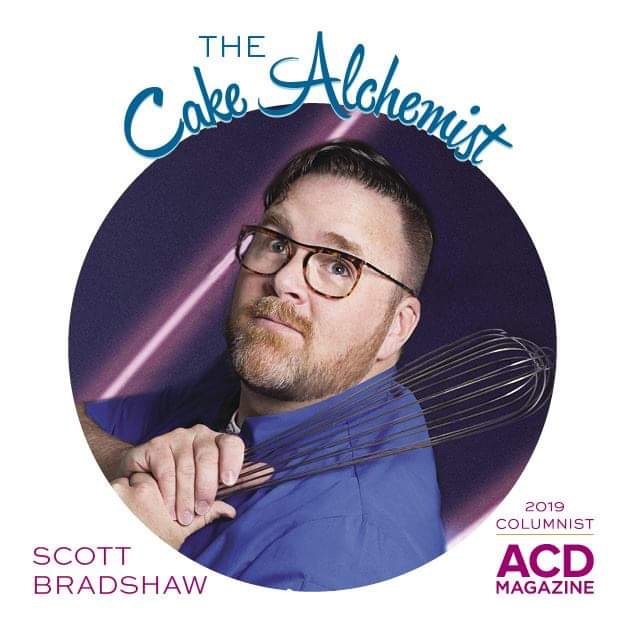 Some twisted individual with a warped sense of humor kind individual… has given me an opportunity to spread my love of weird food combinations in an actual publication. You know, I talk an awful lot of smack for someone who tips over when putting on their underwear… I’ll be completely out of my comfort zone. What I plan to do is take older, tired and worn out recipes that everyone loves and somehow re-invent them. I’m not talking about replacing whole milk with skim milk… I’m talking about totally reinventing it, while keeping the things everyone loves about the original. Go subscribe to American Cake Decorating! Thats where it’ll be. Ill be writing more stuff here, but for the column the main course is in the magazine. You’ll only get scraps here. The problem is… what could possibly fill that void? The next Mark cautiously approached me in the back yard and tenderly said: “Hon… ummm… what are you, ummm… doing?” I replied, “Looking for the best tasting tree” as I shoved more pine needles in my mouth. He looked at me for quite a long time, then slowly backed away. He is officially broken. I’m happy to report that pine trees are yummy, but Blue Spruce has the best flavor of all of them. 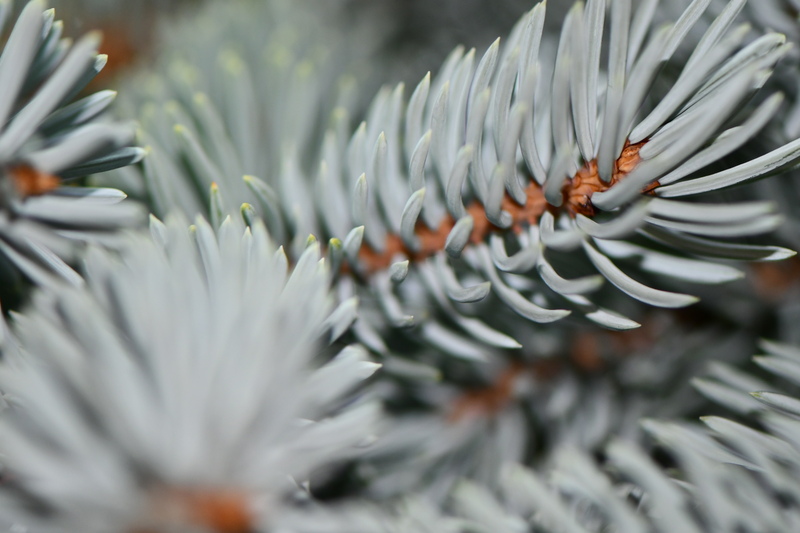 Blue Spruce tastes exactly how a Christmas Tree smells, except it has more of a citrusy herbaceous quality to it. I used it to make an Italian Meringue Buttercream and a Blue Spruce Orange Curd. It is just different enough to make people pause but ever so Christmas-y and winter-y that people will be impressed. Plus, it’s high in Vitamin “C”! Who knew? 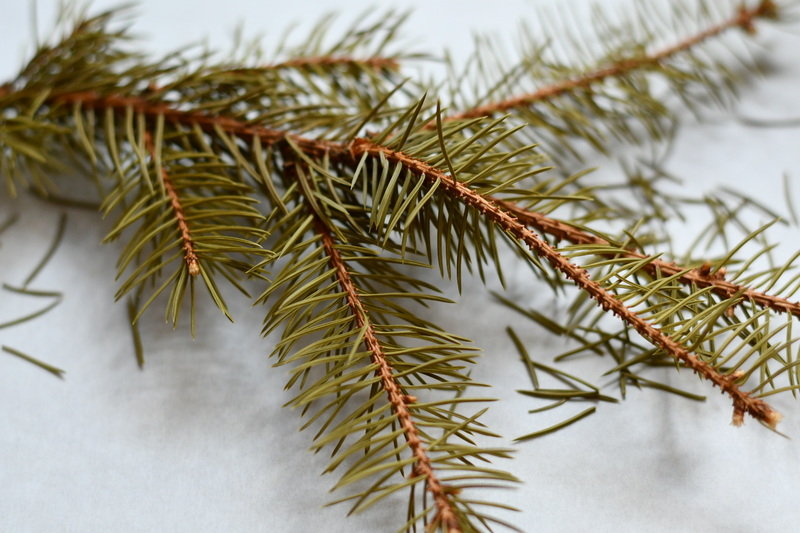 Sourcing your Blue Spruce can be tricky. Sure, there’s always the Christmas Tree lot that you can taste your way through, but I personally wouldn’t. I don’t know this for a fact, but I bet those trees are sprayed with pesticides and preservatives. I wouldn’t risk it. I wouldn’t buy any from a tree store either. If you have one planted in your yard and know its history, give it a taste. Lick it. Tickle its pinecones. Just kidding. I just wanted to see if you would do it. I paired the Blue Spruce Curd and Buttercream with a Cranberry White Chocolate Cake and it was delicious! The tart Cranberry and the sweet White Chocolate are familiar and comfortable with each other. While it’s dehydrating, your entire house will smell like a used cat box. I don’t know how, but it’s not really very pleasant. When its ground up it tasted like a used cat box sprayed with Lysol. If, you know, thats a flavor profile you are shooting for… I figured it out for you. Fresh. Fresh pine is the way to go here. 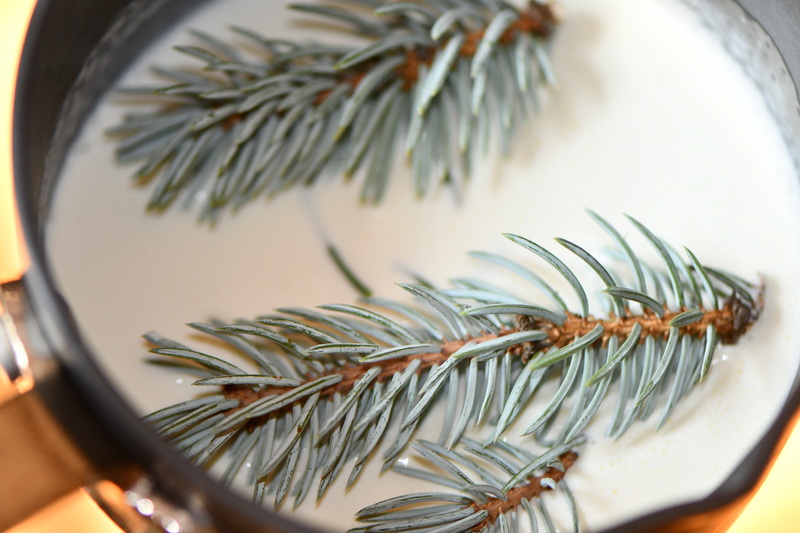 To make Blue Spruce Curd first we are going to make pine needle soup. You can either remove your needles by hand, cut them off with kitchen sheers or, just wash them off and throw them in whole. Boiling them will loosen the needles. 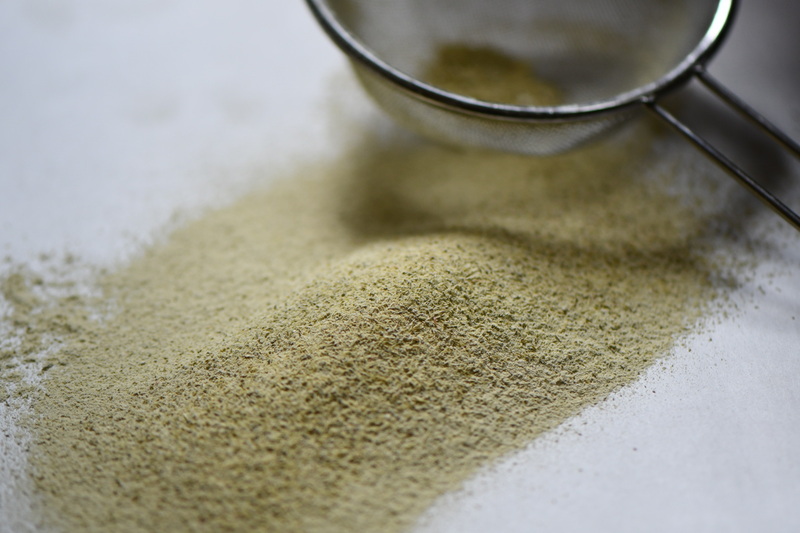 Let the needles steep for 15-20 minutes then blend it up in a blender. 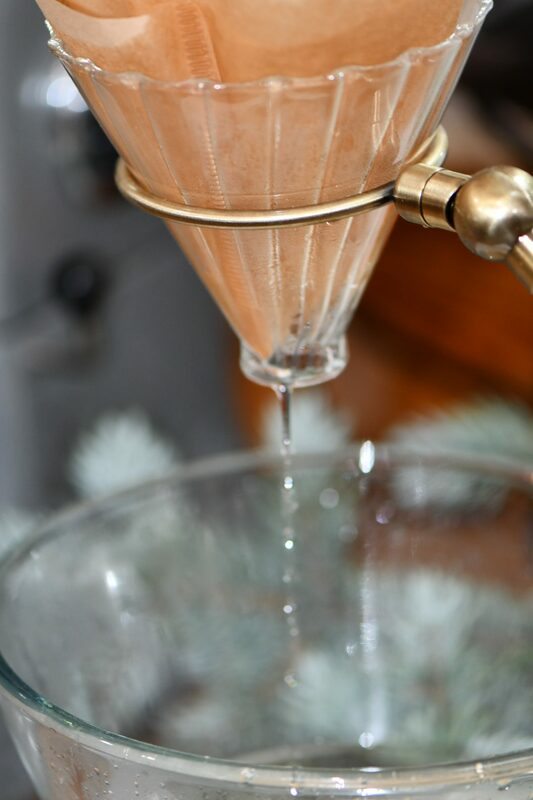 Strain the liquid through a coffee filter. Last Thanksgiving my In-Laws visited from Mississippi. At the time we were using a stupid expensive coffee machine which ground the coffee on a cup by cup basis, brewed it at the perfect temperature, steamed the milk and all-in-one produced a delicious cup of coffee. My Father-inLaw doesn’t enjoy fluffy coffee. When I found out they were coming back for Fourth of July this year I vowed his coffee would NOT be fluffy, and I bought a coffee grinder and a pour over coffee maker. His coffee was not fluffy. I’m glad I re-purposed this as a spruce soup draining apparatus. It will take a while to strain all through. 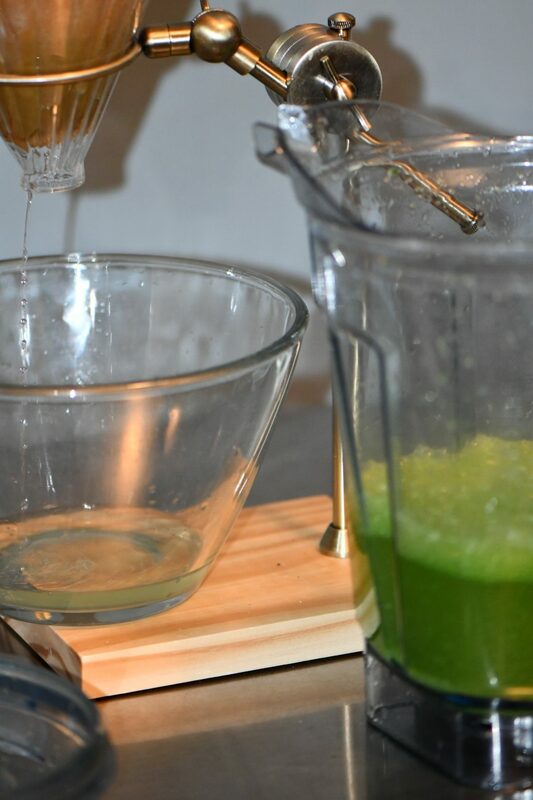 You will end up with slightly cloudy sorta green liquid. It will taste mildly citrusy and pine-y. 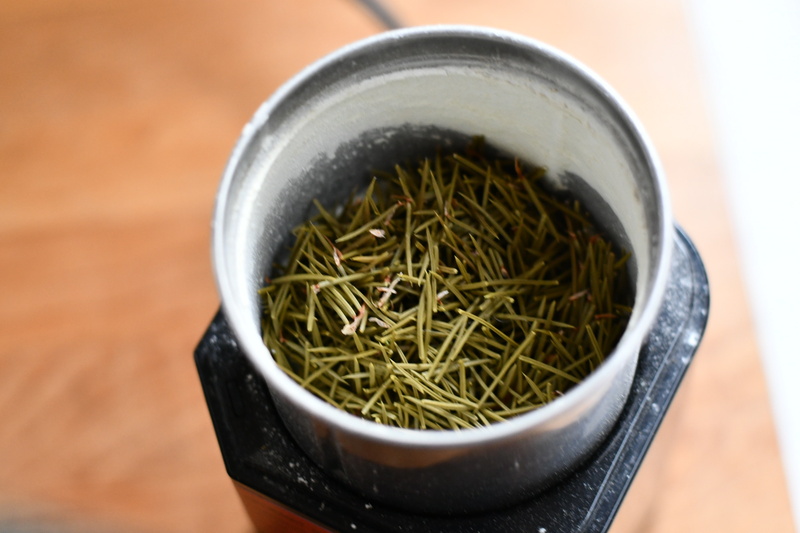 Pour back into the blender and add a whole cup of fresh pine needles and blend again. All together you need 2 cups of liquid. 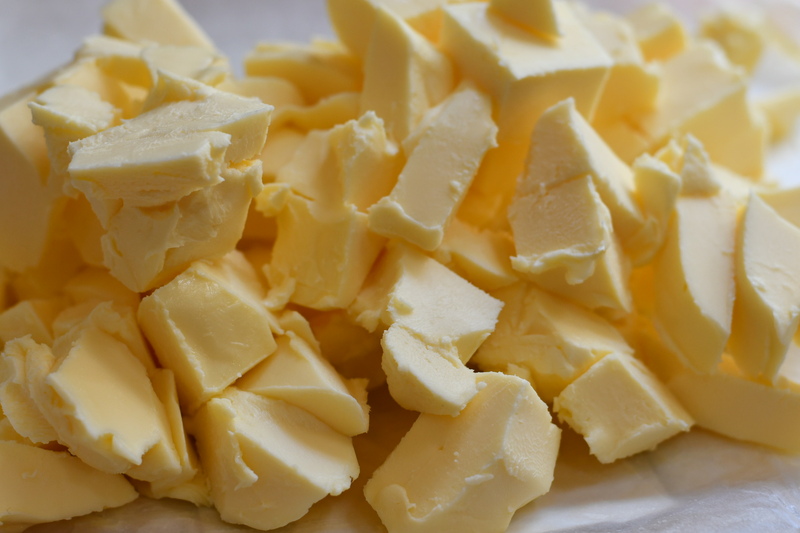 This is the stuff you will use to make your curd. Follow the recipe. Don’t forget to stir in the last little bit of chopped blue spruce after the curd has cooled. It finishes the flavor off nicely. 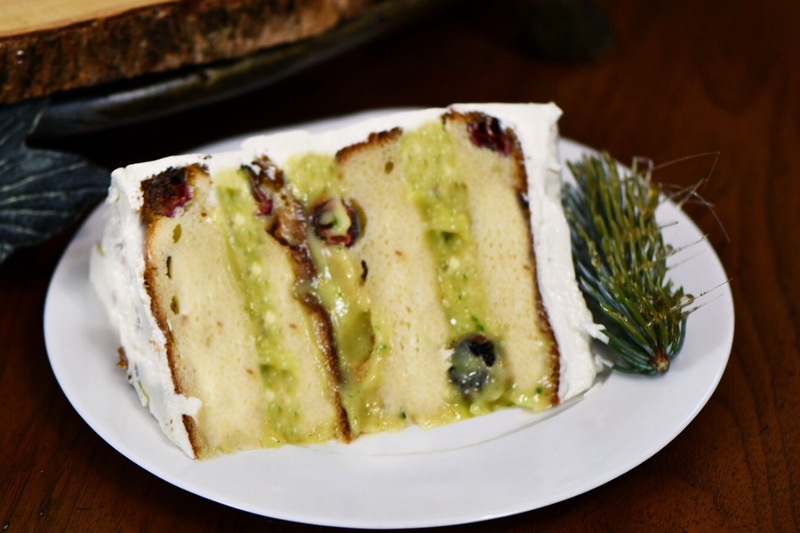 The Cranberry White Chocolate Cake couldn’t be any easier. Dump everything but the cranberries in a mixer, and mix. Fold in the cranberries. Done. 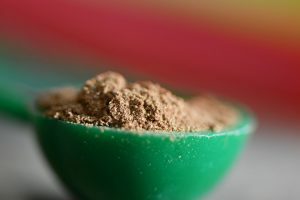 Wonderfully versatile recipe. Mix and match your ingredients, Use white chocolate, milk chocolate, butterscotch, blueberries, raspberries… whatever floats your boat. 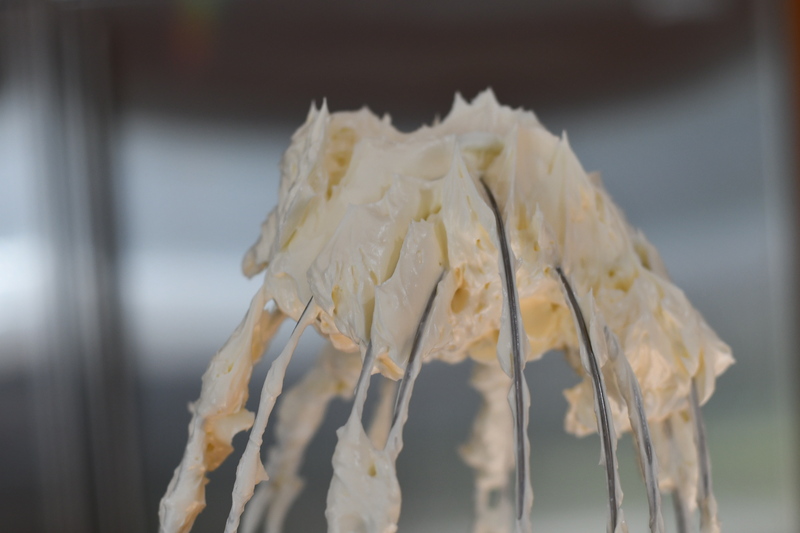 We still have to make the Blue Spruce Italian Meringue Buttercream! 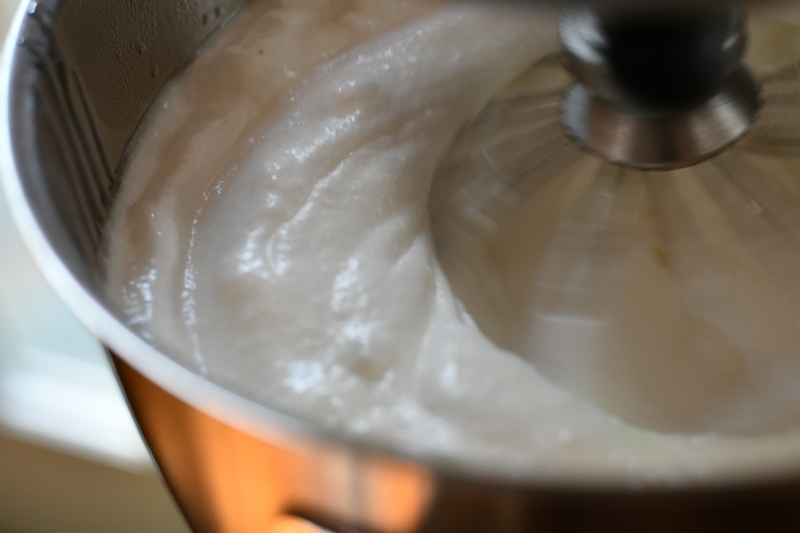 You know how to make Italian Meringue already I’m sure. The only difference with this one is, you add some tree to the sugar. Be very very careful pouring the hot syrup into the meringue. I strained it as I poured it. 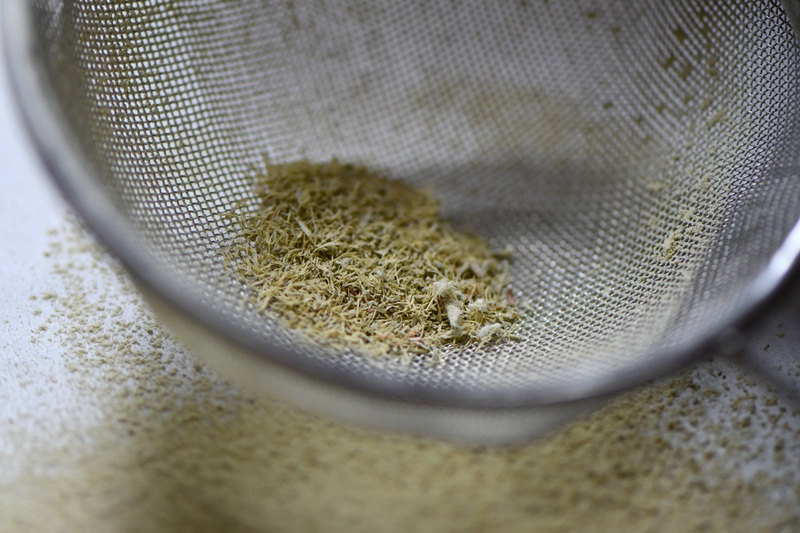 Upon retrospect, you might want to strain it through a sieve first… THEN stream it into the meringue. Whew. A lot of recipes! 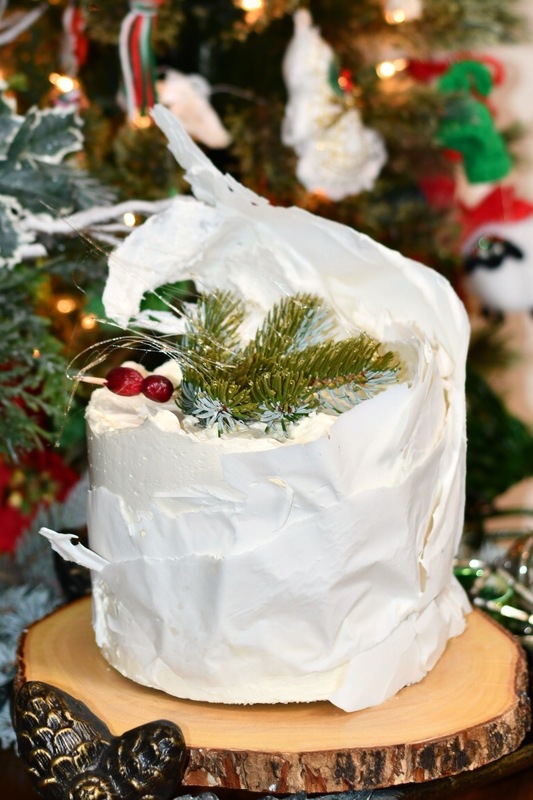 I wrapped my cake with white chocolate and dipped some blue spruce in some cooked sugar for a topper. 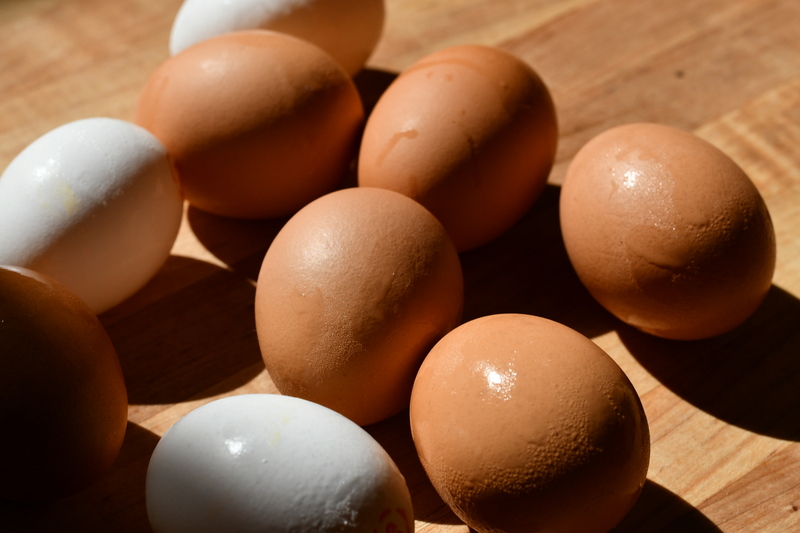 Since I haven’t figured out how to add printable recipes at the end of my post yet… here are links to all that we covered today. American Cake Decorating so you can go subscribe. Cranberry White Chocolate Cake recipe. Blue Spruce Italian Meringue recipe. 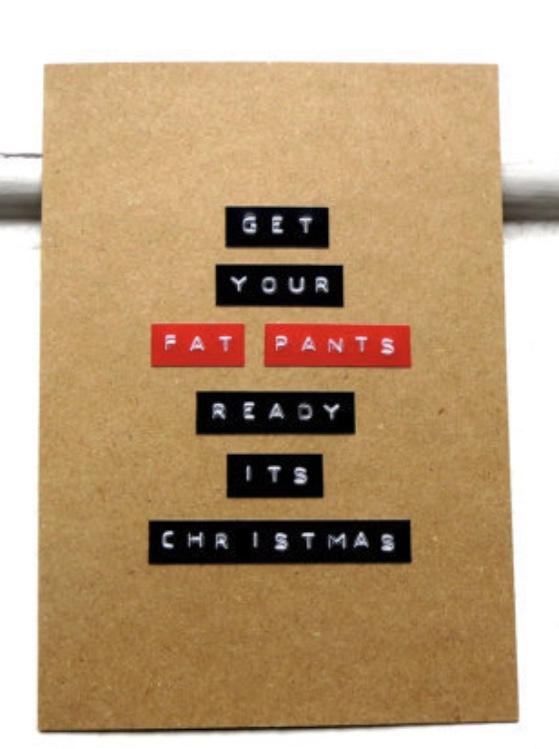 I NEED to know if you make this… and I NEED to know what you think! Leave me your comments! I love you, you brilliant, weirdo creature. When I subscribed, in the section where they wanted to know why I was subscribing, all I entered was your name!